These Trees grow to a great Height, and are usually four Foot Diameter; the Bark is of a brown Colour, the Leaves are pinnated, growing by Pairs on Mender Stalks, the Ribs of the Leaves (like those of the Talia) run on one Side, dividing the Leaf unequally. Not having an Opportunity of seeing its Flowers in their perfect State, I was necessitated to figure the best Fragment of it I could find, which was withered and imperfect, but by spreading the Petals I could distinguish the little Flowers to be pentapetalous, as represented by a Sprig at N1. 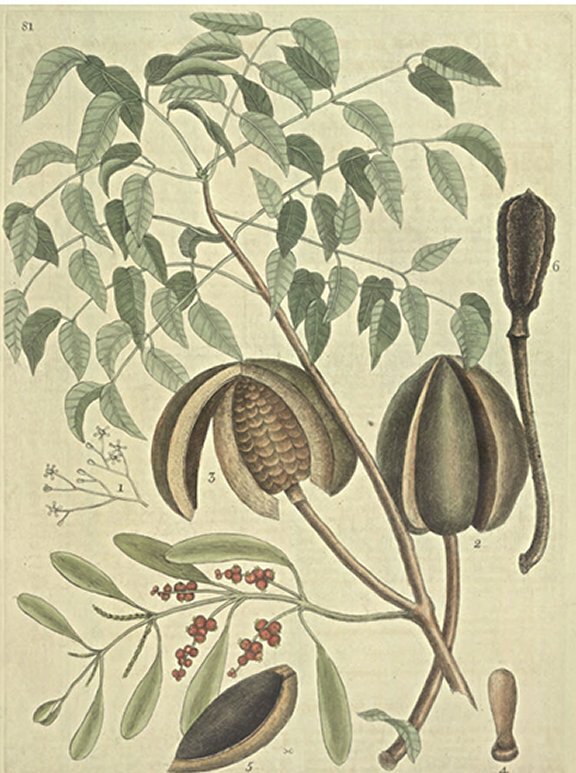 The curious Structure of the Seed-Vessel is thus: The whole Fruit before the Parts are divided, is a very hard smooth Cone, in Size and Form of a Goose's Egg, growing erect on a Stalk four or five Inches long: As this Fruit grows ripe it begins to open, and separate into five equal Parts, each consisting of an hard Shell, near half an Inch thick, lined within by a thin Skin or Membrane, which immediately encloses the Seeds; the Seeds lie disposed in the Manner of those of an Apocynum; they are winged, and are attached to the hollow Sides of an hard pentagonal Core, which forms the Middle of the Cone: When the Shell falls off, the Seeds are left exposed to the Wind, and are soon dissipated by it, leaving the Core standing, which continues so many Months after. The Excellency of this Wood for all Domestick Uses is now sufficiently known in England: And at the Bahama Islands, and other Countries, where it grows naturally, it is in no less Esteem for Ship-building, having Properties for that Use excelling Oak, and all other Wood, viz. Durableness, resisting Gunshots, and burying the Shot without Splintering. This Misleto had long smooth shining green Leaves, growing by Pairs, the Berries were round, red, and somewhat smaller than those of the common Misleto. They grow in Clusters to Stalks of above an Inch long, which Shoot forth by Pairs, from between the Joinings of the Leaves to the Stalk. They grow to Mahogony and other Trees of the Bahama Islands.